1. Don’t just reroll those awkward letters. Always try to use the more valuable letters if you can - and especially any ‘rare’ letters (eg. J, Q, V, X, Z ...etc) as they will score you many more points. Ideally you want to build as long a word as possible including some high-scoring letters. 2. Consider other word options. Don’t get stuck on one word idea and hold out for one letter. 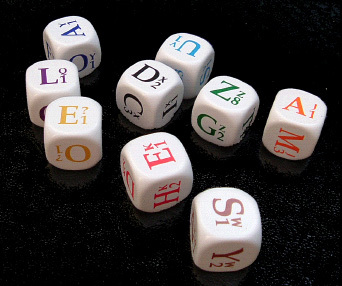 If you rearrange the dice, you may be able to spell something else with what you already have. Or maybe you’ll realise there’s another word you can spell if a different letter comes up. 3. Don’t roll for impossible letters! The Dice Table is the key to DICEWORDS. It can help you assess the odds of getting letters you want. You can also use it to decide which ‘duplicated’ letter to roll and which to keep. What is a good word score? Anything around 80 points is pretty good. but DICEWORDS can be a very skillful game too.